Having a sphere and three diffrent point $A,B,C$ on this sphere. Find set of all centers of spheres inscribed in a tetrahedron $ABCD$, where $D$ is some point on the given sphere. The problem reduced to 2-dimensions is trivial it's just sum of two arcs of some circle, but in 3-dimensions the set is not so simple. 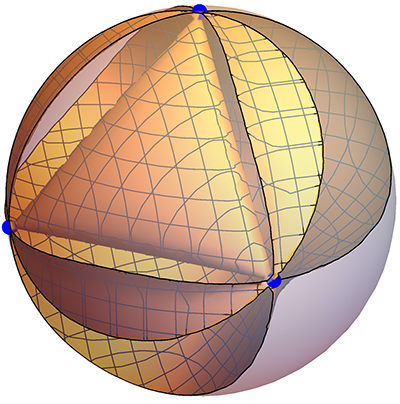 Checking in geogebra it's not sum of some parts of sphere. I don't know what this set looks and how it's described. 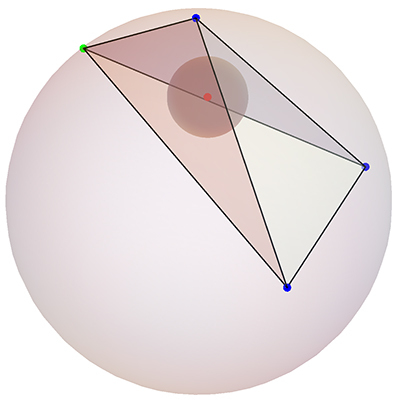 For $A,B,C=$ $(1,0,0)$, $(0,1,0)$, $(0,0,1)$ (blue below) on a unit sphere $S$, the surface is a sort of triangular tea bag with corners at $A,B,C$. 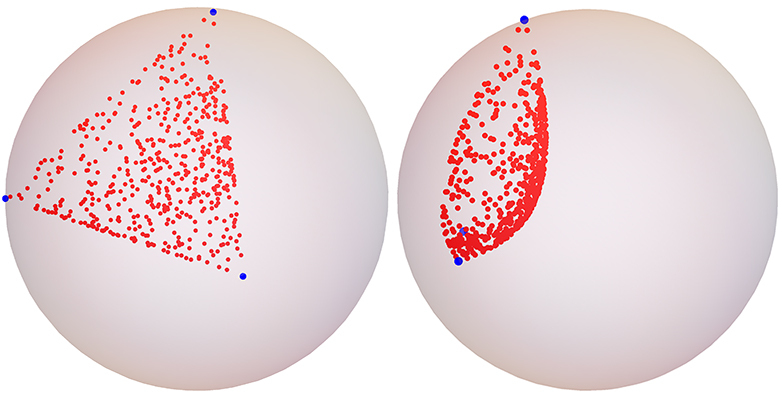 Below are two views of $100$ random tetrahedron incenters (red) on the surface, corresponding to random points $D$ (not shown) uniformly distributed on $S$. A typical $D$ (green), the determined tetrahedron, the inscribed sphere and its (red) center, are shown below. Note one component is the "triangular tea bag" discernable in my empirical investigation. Here is the polynomial: $$ 2 x^5+x^4 y+x^4 z-7 x^4+2 x^3 y^2+4 x^3 y z-10 x^3 y+2 x^3 z^2-10 x^3 z+8 x^3+2 x^2 y^3-12 x^2 y^2 z-15 x^2 y^2-12 x^2 y z^2+6 x^2 y z+15 x^2 y+2 x^2 z^3-15 x^2 z^2+15 x^2 z-2 x^2+x y^4+4 x y^3 z-10 x y^3-12 x y^2 z^2+6 x y^2 z+15 x y^2+4 x y z^3+6 x y z^2-6 x y z-4 x y+x z^4-10 x z^3+15 x z^2-4 x z-2 x+2 y^5+y^4 z-7 y^4+2 y^3 z^2-10 y^3 z+8 y^3+2 y^2 z^3-15 y^2 z^2+15 y^2 z-2 y^2+y z^4-10 y z^3+15 y z^2-4 y z-2 y+2 z^5-7 z^4+8 z^3-2 z^2-2 z+1$$ The plot above restricts $(x,y,z)$ to lie on or in the sphere. Not the answer you're looking for? Browse other questions tagged ag.algebraic-geometry mg.metric-geometry or ask your own question. Is there a generalized Feuerbach point for an irregular non-Euclidean triangle? “Japanese Theorem” on cyclic polygons: Higher-dimensional generalizations?